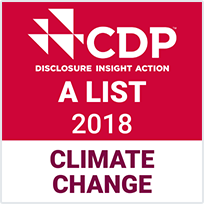 Tokyo, Japan - Sony Corporation (Sony) has been included in the CDP's A-List*1 for the 4th consecutive year, recognizing it as one of the highest performing companies in its efforts to reduce the energy consumption of its products, curb greenhouse gas emissions, and accelerate the use of renewable energy. Approx. 50% reduction of annual energy consumption per product (target: average reduction of 30% compared to FY2013). Approx. 12% reduction of absolute greenhouse gas emissions at all Sony sites (target: 5% reduction compared to FY2015). Additionally, in its pursuit of a zero environmental footprint, Sony joined RE100*2 in September 2018, and will aim to use 100% renewable electricity for all of its business sites by 2040. Through these and other measures, Sony will continue striving to minimize the environmental footprint of its value chain, bring forth environmentally conscious products and services, and work to create a better and more sustainable society, toward the achievement of its "Green Management 2020" targets and ultimately an environmental footprint of zero. The CDP is a nonprofit organization (NPO) founded in the UK in 2000. Backed by investors from around the globe, it conducts surveys on climate change and water management responses at private companies, then analyzes and releases the findings of these surveys to the public. This year, the CDP surveyed over 3,000 companies globally on behalf of more than 650 institutional investors representing more than 87 trillion U.S. dollars in managed assets. *1The rating system is a 4-rank scale (A, A-, B, B-, C, C-, D, D-). The A List is made up of the companies awarded the highest performance rank of "A." *2A global initiative whose members seek to supply the electricity for their business activities using 100% renewable energy.